Making their first appearance since Arctic Thunder 2010, the Association is thrilled to have the Blue Angels as the featured jet team for Arctic Thunder, 2016 at Joint Base Elmendorf Richardson. 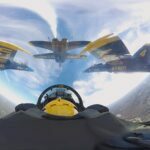 The Blue Angels showcase demonstrate the Unites States Navy and Marine Corps’ commitment to professionalism, excellence and service through these world-class flight demonstrations and community outreach. 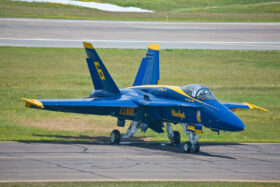 The Blue Angels are comprised of 16 officers fill the flying and support positions. Jet pilots have aircraft carrier qualifications and at least 1,250 tactical jet flight hours. Over 100 enlisted personnel support the demonstration squadron, with such specialties as airframes, avionics, aviation medicine, crew chiefs, logistics, among others. 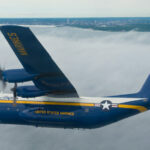 The Blue Angels fly the Boeing F/A-18 Hornet and the Lockheed Martin C-130 Hercules. 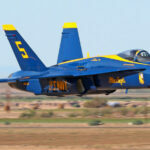 Please visit their website at www.blueangels.navy.mil for more great information and exciting videos.